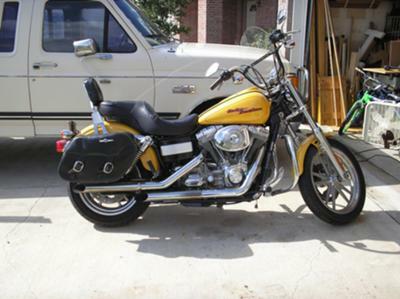 The 2006 Harley Dyna Super Glide for sale is a beautiful motorcycle that is very comfortable to ride but my husband had surgery and can't ride anymore. You won't find a nicer 2006 Dyna for sale in Austin Texas, on Craigslist or in an Ebay auction so hurry and make an offer before it gets away from you! If you need more pics and info please e-mailing me your questions and offers using the space below that has been provided by Strike Lightning Used Harley Motorcycles for Sale (and PLEASE do not neglect to include your contact information in your email or to provide a phone number or email address!) so that I can respond with answers to your questions or after consideration of your best offer as quickly as possible. Strike Lightning would also encourage bikers to submit a review of the 2006 Harley Dyna Super Glide to make the biker community aware of any problems that are commonly associated with the or to highlight its positive features and help potential buyers make informed decisions. She's in Texas, in the Austin area. The Pay-Off on this is about $11,500 as of October 1st. Hi there. I may be interested in taking the Harley Davidson Dyna Super Glide off your hands if you can contact me and tell me the pay off amount. Al 806-549-7775. I read your page advertising the 2006 Dyna Super Glide for sale and it is unfortunate that your husband cannot ride anymore. It's tough when our health won't let us do the things that we really would love to do and he has my sympathy. Can you please tell me is the motorcycle in the classified still available? What is amount of the loan pay off if there is one and which state do you live in?